Welcome to the nineteenth edition of email marketing tips on March 23rd, 2010. This is the first edition of my email marketing tips blog carnival this year. I have hand-picked all entries myself and hope that I will get useful blog article submissions to the next edition. By the way: Here is the complete archive with highlight of the best contributions with useful email marketing tips. Browsing Tip: If not stated otherwise all links in this email marketing tips carnival edition will open in this window. Use the back button of your browser to come back here or open links in a new window or tab. 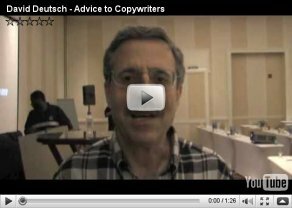 David Deutsch gives copywriting advice to Doberman Dan. John’s comment: With that tip you actually can earn while you learn. Doesn’t matter if you get started with direct mail or you simply start to build an list of your own. John’s comment: And think about the fact that there is a growing number of mobile devices that have e-mail clients with limited display capabilities. John’s comment: My humble post for this edition. What do you think? Leave a comment. Now go on to read edition 20 of email marketing tips blog carnival. Past posts and future hosts can be found on my index page for email marketing tips. P.S. : If you like this edition, check out the previous email marketing tips - edition 18, too. P.P.S. : And submit your related blog article for the next edition. Do it right, now. Posted by John W. Furst in Blog Carnival, Email Marketing Tips, Marketing on Wednesday, March 24, 2010 has got 5 Comments. Hallo Mr. Furst! Very good that you continue with this posts. Thank you. 2) The internet is direct mail with jet propulsion. You can "ship", send, and test much faster (and cheaper). So do it. 3) You can even use (gasp) snail mail. I just got yet another AdWords coupon from Google. I hope to see one of your articles in my next edition.